17th annual MACC Raffle, Part B; Winter, R46765, $5 ticket blitz going on throughout the festival weekend, look for Chamber volunteers at many festival events! Green Acres Open House from 2 to 4 PM, 1025 E. Ash Street. Call 676-1484 for more information. LEGO Club at the Mason Library (ages 4 and up) at 4:30 to 5:30 PM. Registration required. Call 676-9088 for details. Thursday Night Live Courthouse Concert in downtown Mason on the Ingham County Courthouse lawn with the Mason High School Band and Cheer Squad at 6 PM. Bring lawn chairs/blankets. Presented by Independent Bank and sponsored by CP Federal Credit Union. Hot dogs, chips and pop sold by Mason Optimist Club. Weather permitting. BINGO! at the Masonic Hall, 800 E. Columbia, corner of Columbia and Temple, doors open at 4 PM, bingo runs through 10 PM. Mason High School Homecoming Parade from and to Mason High School through the downtown between 5:00 to 6:00 PM. “Fall Family and Fido Walk” on the Hayhoe Riverwalk sponsored by CAPEX Land Company starts at Ash Street across from the pavilion above Lee Austin Park by the railroad tracks from 6:30 PM to 7:30 PM hosted by MACC. Free. Weather permitting. Mason High School Homecoming and boys’ varsity football game against Lansing Eastern, 7 PM, stadium at 1001 S. Barnes Street on the south side of Mason. 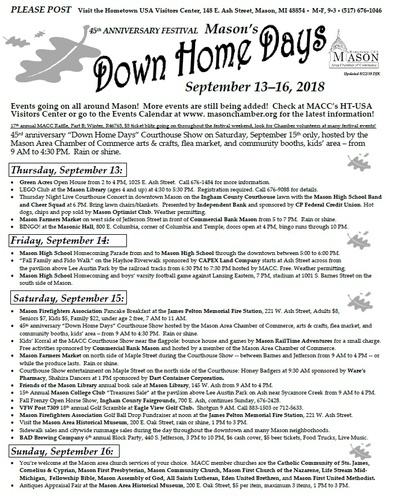 45th anniversary “Down Home Days” Courthouse Show hosted by the Mason Area Chamber of Commerce, arts & crafts, flea market, and community booths, kids’ area – from 9 AM to 4:30 PM. Rain or shine. Courthouse Show entertainment on Maple Street on the north side of the Courthouse: Honey Badgers at 9:30 AM sponsored by Ware’s Pharmacy, Shahira Dancers at 1 PM sponsored by Dart Container Corporation. Fall Frenzy Open Horse Show, Ingham County Fairgrounds, 700 E. Ash, continues Sunday, 676-2428. VFW Post 7309 18th annual Golf Scramble at Eagle View Golf Club. Shotgun 9 AM. Call 883-1503 or 712-5633. Mason Firefighters Association Golf Ball Drop Fundraiser at noon at the James Pelton Memorial Fire Station, 221 W. Ash Street. Visit the Mason Area Historical Museum, 200 E. Oak Street, rain or shine, 1 PM to 3 PM. Sidewalk sales and citywide rummage sales during the day throughout the downtown and many Mason neighborhoods. BAD Brewing Company 6th annual Block Party, 440 S. Jefferson, 3 PM to 10 PM, $6 cash cover, $5 beer tickets, Food Trucks, Live Music. Antiques Appraisal Fair at the Mason Area Historical Museum, 200 E. Oak Street, $5 per item, maximum 3 items, 1 PM to 3 PM.